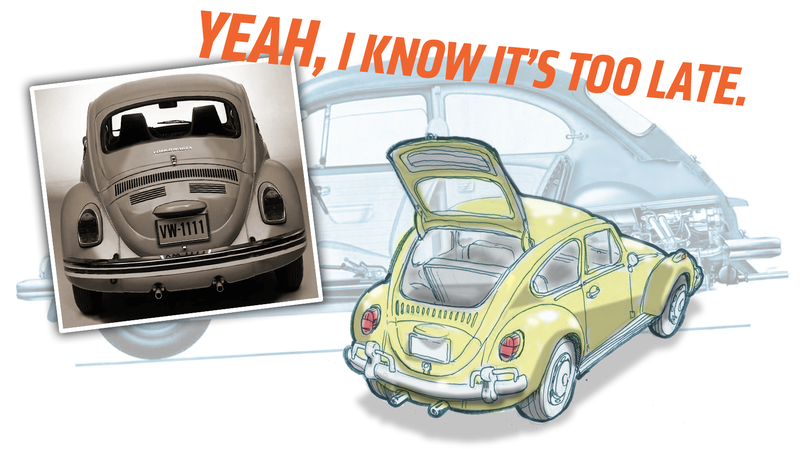 Air-cooled-era Volkswagen was a company that revolved around a strange contradiction: it built cars that were fundamentally different from most other carmakers, but they were surprisingly conservative, technically. Any change to their core products was incremental and carefully considered. I think VW’s unwillingness to try radical changes prevented them from making what could have been one of the most important and beneficial changes to the iconic Beetle. Too bad I’m 50 years too late for this to matter at all. Sure, it doesn’t matter now at all, but just on the off chance one of you out there is on the brink of a time-travel breakthrough or perhaps this is being read by someone fiddling with the knobs on the Large Hadron Collider, here’s my point: the Volkswagen Beetle should have become a hatchback around, oh, 1966 or so. The more I think about this the more I wonder why Volkswagen never seemed to consider this idea at all, as far as I can tell. I’ve yet to see a prototype or even a drawing that’s close to what I’m suggesting, which is strange because VW actually was already producing just about everything they’d need to make it actually happen. In fact, Volkswagen was producing three cars in this era that had, essentially, the same sort of rear-engined hatchback design that I’m suggesting: the Type 2 Microbus, the Type 3 Squareback, and (in low volumes, admittedly) the Type 147 Fridolin. The principal reasons for the development of the Super Beetle was to increase the utility of the vehicle by providing the customer with a larger luggage compartment and greater comfort. Greater utility, luggage accommodation, and comfort. VW had to update the 1930s-era Beetle design to compete with the new cheap small cars coming out of Japan, nearly all of which beat the old Beetle in those key areas. Making the Beetle a hatchback would have accomplished these goals very well, and the hatchback design combined, later, with the Super Beetle’s new front-end improvements would have made the Beetle much more competitive. Well, in my mind, at least. Here’s how Volkswagen could have done it and I believe saved on costs, too: by standardizing on the Type 3 engine design. For those of you with healthy social lives and no crippling obsession with air-cooled VWs, a quick explainer is in order. The engine the Beetle (and the Karmann-Ghia, buses until 1972, the Thing, etc) is called the Type 1 engine, and it’s a flat-four design with a cooling fan mounted above the engine block, driven by a belt. The Type 3, introduced in 1961, had an engine that was virtually identical to the Type 1 on the bottom end, but had the cooling fan mounted on the crankshaft. This allowed the tallish Type 1 engine to be compressed to a low, suitcase-like shape, and eliminated the danger of overheating if one belt breaks. The result was that the Type 3 engine was compact enough that it could sit under the floor of a rear luggage compartment, as it did in the Type 3 line, which included a sedan, fastback, and wagon. The wagon, known as the Squareback, had a hatchback design and a good amount of luggage room over the engine. The bottom ends of the Type 3 and Type 1 engines are nearly identical; you can bolt one or the other right into either car. The real differences are in the packaging of the fuel and cooling systems. What Volkswagen should have done, probably starting about 1965 or 1966, is to eliminate the Type 1 engine and standardize on the Type 3. The Type 3 cars were positioned above the Beetle and had more power, first via having twin carbs, and then later the first electronic fuel injection system ever on a mass-produced car. VW could have kept this class distinction, and only offered a one-carb version of the Type 3 motor in Beetles, so while the power wouldn’t have changed much, the engine would take up much less vertical room, allowing for the body redesign to give the Beetle a much larger rear luggage compartment with a hatch. Producing only one engine design instead of two should have provided a big cost savings for Volkswagen all throughout the production and supply chain. While the new Beetle-with-a-hatch may have cost a bit more than the old standard Beetle, the new engine and interior layout could have been used in an old-body Beetle with no hatch for the bottom-end, low-price car, and even a hatchless Beetle with a Type 3 engine would have a much larger rear luggage compartment. Man, why didn’t VW do this? It seems to make so much sense! A hatchback design was a big deal in the ‘70s. Hatchbacks have come to define small-car flexibility and convenience. A Beetle with a usable front trunk and a very useful hatch, which would have been at least as roomy as the hatch of a first-gen Honda Civic, could likely have fared better against the onslaught of new cheap small cars that came in the ‘70s. So, if there’s any bored time-travelers out there looking for a reason to kill some time in mid-’60s Germany, please feel free to print this article out and drop it off in Wolfsburg for me. Oh, and put a buck or two in a savings account in my name, while you’re there in the past? I’ll pay you back yesterday.